Linn Meyers (American, b. Washington, D.C., 1968; lives and works in Washington, D.C.) will create her largest work, “Our View From Here,” at the Smithsonian’s Hirshhorn Museum and Sculpture Garden this spring. The site-specific wall drawing, which stretches the entire circumference of the inner-circle galleries on the museum’s second level, more than 400 linear feet, will be on view May 12, 2016–August 13, 2017. The drawing is temporary and will be painted over at the end of the exhibition’s yearlong run. 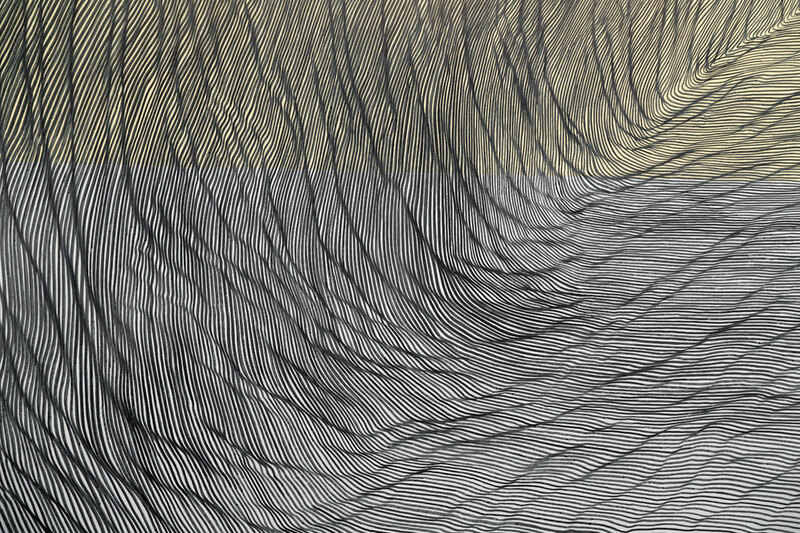 Meyers will discuss her work in a Meet the Artist talk Wednesday, May 25, 2016, at 6:30 p.m.
Meyers creates her works by hand-drawing thousands of closely spaced, rippling lines, each nested beside the one that came before it. Drawing alone for long hours each day with a type of marker often used by graffiti writers, she welcomes the imperfections that are a natural part of working without templates or taped lines. The resulting patterns flow and pulse with energy. Meyers has had solo exhibitions at the Hammer Museum in Los Angeles, the Phillips Collection in Washington, D.C., and the American University Museum at the Katzen Center in Washington, D.C., among other venues. She has participated in group exhibitions at institutions including the Hirshhorn, the Phillips Collection, the Smithsonian American Art Museum, the Corcoran Gallery of Art and the National Museum of Women in the Arts, all in Washington, D.C., the Tokyo Metropolitan Museum of Art and the Mattress Factory in Pittsburgh. Her work is in numerous public and private collections, including the Hirshhorn, the Phillips Collection and the Smithsonian American Art Museum. She received a Master of Fine Arts from the California College of the Arts and a Bachelor of Fine Arts from the Cooper Union.